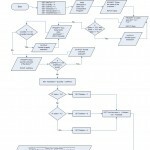 TCO 3: Given a simple problem, design and desk-check a solution algorithm requiring a modular design that is expressed in terms of pseudocode or program notes, input-process-output (IPO) analysis, and flow chart. TCO 7: Given a program with logic errors that is intended as a solution to a simple problem, employ debugging diagnostics to remove and correct the errors. TCO 8: Given a more complex problem, develop a complete solution that includes a comprehensive statement of the problem, complete program design, and program documentation. Your algorithm will write two functions called ComputeTotal( ) and ComputeTax( ). ComputeTotal( ) will receive the quantity of items purchased, and the unit price of each item. It will return the total sales (quantity times price). ComputeTax( ) will receive total sales as a number and the state as a string and return the amount of tax depending on the state. 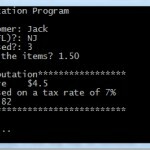 NJ requires 7% tax, FL requires 6% tax, and NY has 4% tax. 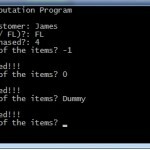 The main program will ask for the name of the customer and read the name in a variable called name. It will also ask for one of the three states listed above. It will ask for the number of items sold and the unit price of the item. Main will then call ComputeTotal( ), passing the quantity and unit price. Main will then call ComputeTax( ), passing the state and the amount of sales and receive back the tax. Finally Main( ) will print out the total sales, the tax amount, and the total with taxes. For example, see below. Make sure you save the return values into an appropriate variable. 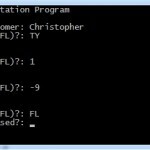 Use formatted output to make the program more user friendly. 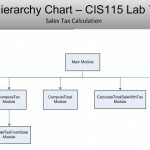 Use MS Visio to create a hierarchy chart. Paste the hierarchy chart here, or attach it as a separate document.